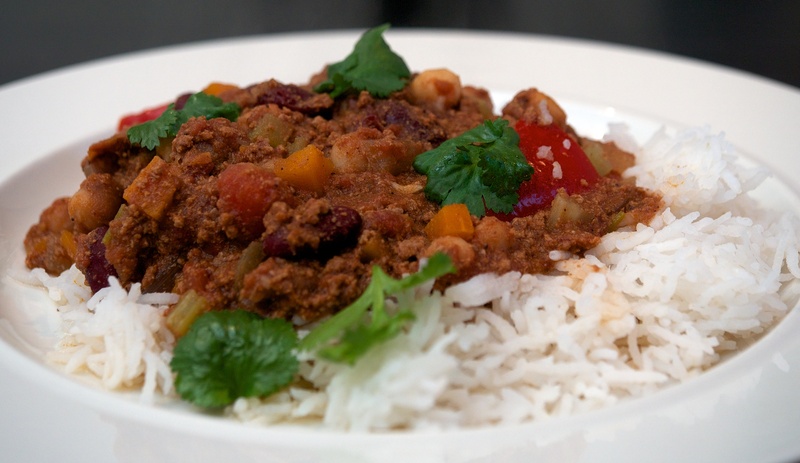 We’ve tried loads of recipe for Chilli Con Carne. This is a good hearty version and we loved the addition of chickpeas and plenty of spice. Perfect for a cold night! Wine Suggestion: Go juicy, red and with a bit of spice; youthful Cotes du Rhone would work, but so would other Grenache based wines such as a Spanish Garnacha. Alternately think Primitivo or Zinfandel but make sure the wine you choose isn’t too big as extra tannins might fight the spice in the Chilli; juicy is best here with depth and personality. Our choice was a Lirac from Domaine Joncier – their “le Gourmand”, which had juicy plum flavours, hints of mocha, a touch of rosemary and warm velvety spices. Heat about 1 tbsp of the olive oil in a large casserole and add the onions, garlic, carrots, celery and red peppers. Add the chilli powder, cumin and cinnamon and season well with salt and pepper. Cook, stirring regularly, for about 7 minute or until the vegetables are softened and lightly coloured. Add the chickpeas, kidney beans and tinned tomatoes. Next add the mince, breaking it up with a wooden spoon. Fill one of the empty tomato tins with water and add this to the pan too along with the chopped coriander stalks, the balsamic vinegar and some more salt and pepper. Bring to the boil and turn the heat down to a simmer and cook, partially covered, for 1 hour and 15 minutes, stirring occasionally. Then, take the lid off and cook for a further 15 minutes. Add a splash of water at any stage if it starts to dry out. Serve with rice or a baked potato and some yoghurt or guacamole and lime wedges. Love seeing the chili served over rice! My mom always made rice to go with chili when she made it. The first time I did it, my husband looked at me like I was crazy! Tonight we’re having chili as one of the topping choices for a “loaded” baked potato bar. I do use cinnamon and plenty of other spices in my chili, but have never thought to add chickpeas- usually just the kidney or pinto beans. Will have to try the new addition next time! The chickpeas are good and they bulk it out so you don’t need too much meat.